For those who love risk, take a look at DirexionShares. It exemplifies the proliferation of leveraged ETFs - particularly the ones that give you three times the return (3 x ETFs). Take for example the one with the ticker symbol GASX - that's right, the same name as the famous medicine. It's an ETF that is 3x short natural gas equities. GASX Fund Objective: - "The Direxion Daily Natural Gas Related Bear 3x ETF seeks daily investment results, before fees and expenses, of 300% of the inverse (or opposite) of the performance of the ISE Revere Natural Gas Index. There is no guarantee the fund will meet its stated investment objective." From its inception (about two years ago) GASX is down 38.5%. The negative 3x the natural gas index (which is what the ETF is supposed to be tracking) is up 17% for the same period. If you bet against natural gas companies 2 years ago, you would have been right, but this ETF would have lost you close to 40%. Ouch. What makes this even more interesting is that its twin, GASL, the 3x long natural gas index ETF is is also down for that same period - a whopping 48%. What gives? 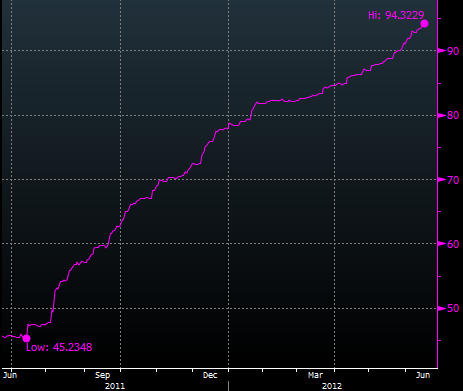 This is what's known as leveraged ETF slippage (illustrated here). Over time you lose either way. And the higher the volatility the more you lose. The chart below shows GASX daily annualized vol - over a period of 250 business days - approaching 100%. Using shorter periods, the volatility measures are even higher. That's why slippage is such a big problem. Now if you want to find alternative ways of losing money, try some of the other Direxion ETFs. Indian equities, long-term treasuries, semiconductors - whatever your heart desires - all 3 times. Who said that derivatives and leverage was just for the big guys? It is in fact remarkable that this is a retail product. But no worries, there is proper disclosure. Fact sheet disclosure: - Investing in the funds may be more volatile than investing in broadly diversified funds. The use of leverage by a fund increases the risk to the fund. The Funds are not suitable for all investors and should be utilized only by sophisticated investors who understand leverage risk, consequences of seeking daily leveraged investment results and intend to actively monitor and manage their investment. The Funds are not designed to track the underlying index over a longer period of time. And clearly most retail investors will read this and say: "but of course, the volatility is extremely high - so I should expect some tremendous slippage risk."